After a bitter cold snap, it's warmed up a bit to the 20s and 30s this week. Yesterday I was running around doing errands with Aveline and I had to ditch the coat. Hauling around a diaper bag, shopping bags, purse, and baby carrier is no joke. I keep warm playing the pack mule. And as a bonus, my arms are starting to see some definition! When I know I am going to be in and out of stores and my car (with amazing heated seats), I typically dress in layers like a thin tee and thick sweater or flannel plaid and vest instead of a heavy coat to avoid overheating. Because of this, I own quite a few vests! 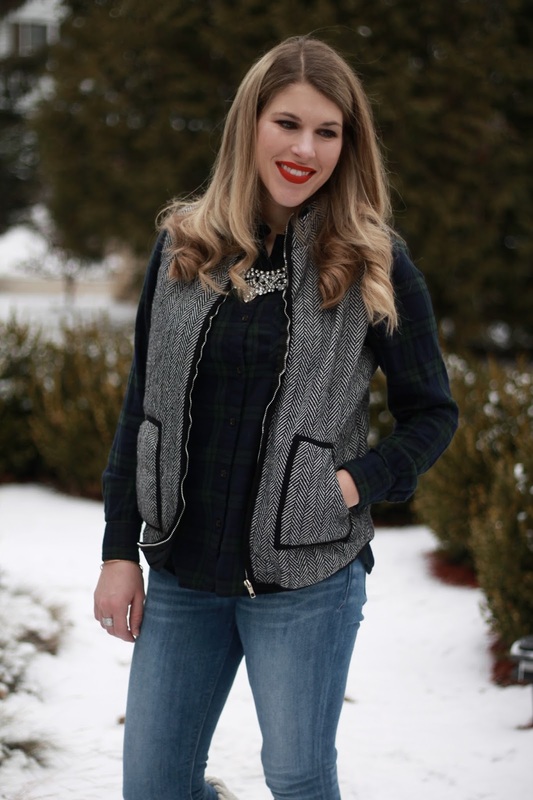 I had a similar vest that I got at Target years ago (worn 20 ways in this post), but it was always a little snug and not exactly so I spotted this herringbone vest on sale on Amazon for only $20 and bought it right away! It's a little more expensive now, but I linked to a cheaper one, too. I love that it is made of a thick tweed and not nylon like the J.Crew version. It definitely fits true to size. I am wearing a small for reference. And for only $20 I can't complain. Even though this vest isn't as on trend like it once was, it goes with so many things and makes a great layer. I know I will still be wearing it a ton! Last week's most popular post was from Tatiana at My Fabulous Forties. I loved her statement of, "some rules have to be broken!" I'm not really a vest person, but yours looks great! :) Such a good price too! :) I really like your boot liners too, they look so cosy! That vest is great, my mom recently got one like it at Talbot's. It's a great piece because it goes with so much - looks great with your jeans but can also be dressed up. Love it! Ugh, warming up to 20 -30 degrees, God bless, I have no idea what that must feel like. Stay warm!!! GREAT vest and love the boots! You look like the cutest snow bunny! Such a cute, preppy outfit! Loving those boot lines. The dark plaid is one of my favorites and yet I don't own it. Thanks for the reminder to wear a statement necklace with my vest. Happy New Year, Laura! Laura, this is the perfect outfit for running errands as a pack mule! I remember those days of hauling babies, diaper bags, strollers in and out of the car, car seats, and everything else. You definitely do get overheated quickly! But at least you look fabulous underneath all the baby gear! That vest is such a classic! I love me some layers too. I have one like it, but it's nylon and I don't love that, so I rarely wear it! The tweed version is way better! Very cute look! I love that vest and those boots and I have similar and want to recreate this look! Vest are one of my faves---especially when they are tweed like this!! What a cute vest and great price! I agree with Brooke in that I think it's a classic piece now. Love this snowy look! The necklace was the perfect finishing touch! Only another Wisconsin gal considers the 20s and 30s warm and time to ditch the coat! I am so with you girl! I wear my puffer vest more than a winter coat in the winter because I'm basically just dodging from car to building and I get overheated inside with a full winter coat on. Love your vest! So cute! I have to dress in layers while I shop too. I can't be bogged down by a heavy coat. 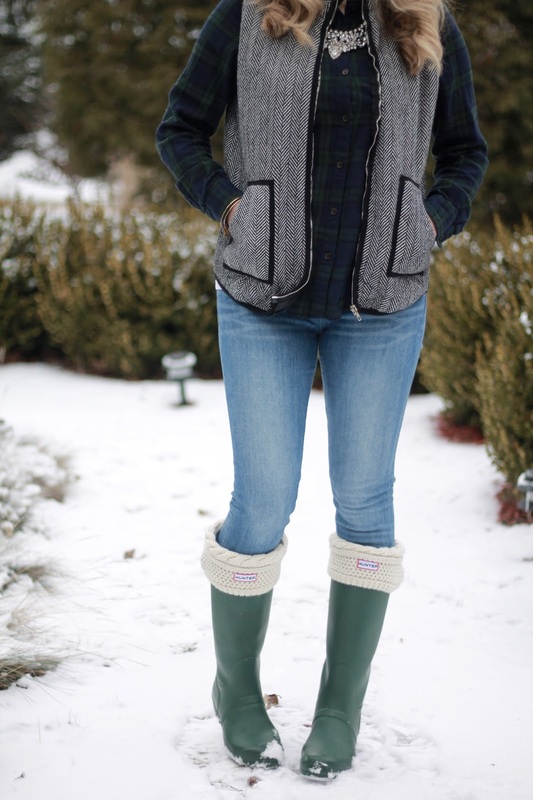 Love this look, the blue and green plaid is so fun and I love those hunters! This is such a cute winter look! 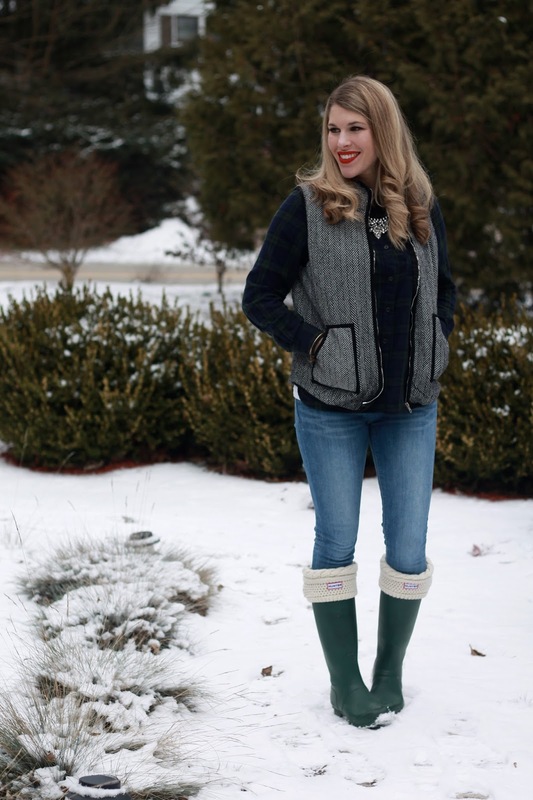 I love the vest paired with the plaid and Hunter boots. Isn't it funny how temps in the 30s feel like spring after the cold we have been having! I am a big fan of vests. And you styled it very well, Laura! Great winter look! 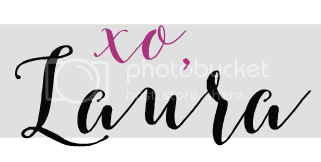 Thank you so much for choosing my photo from last the link up! Loving your Hunters, lady- I have a bright teal pair that work for spring, but need a pair I can rock in the winter! Hey Claire, happy New year and you look so amazing in this outfit! I hope your New Year is fabulous! I went through a phase a few years ago where I really wanted Hunter boots and I'm starting to feel that same urge again! I love the color of yours! 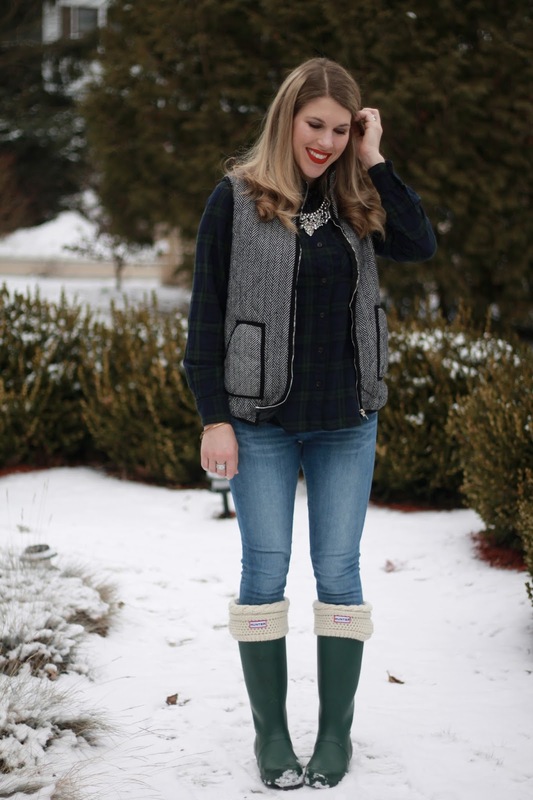 Love your vest Laura and your green hunter boots look darling with this look. Such a pretty outfit! I just love those green boots and how it picks up the color in your plaid shirt. I have a herringbone vest and I wear it a lot! I have those same Hunter wellies, with the sock liners too—they're the best! Stay warm! So cute Claire- love how you added a statement necklace too!! You are ready for snow! Thank you for hosting! 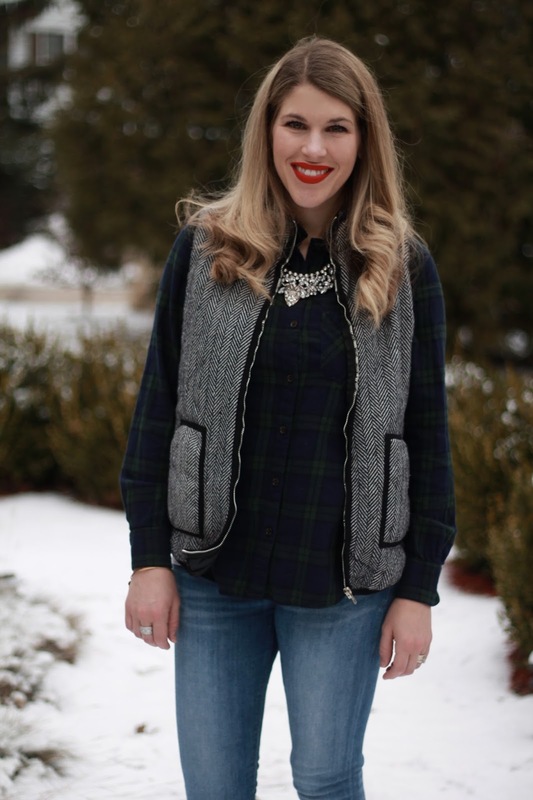 That vest is such a great layering piece! I love the sparkly necklace! Pretty crazy to consider the 20's & 30's warm but I remember that in MN. You are right, hauling a baby and all that stuff is no joke, I also remember those days. Your vest is perfect and I love the necklace with it. Cute as always! I really love that vest, it looks so great on you. The 30s definitely would feel warm compared to the single digits! This vest looks awesome on you, and what a great deal! Love that vest - I have a similar one and the style is just so cute. Yay for getting some arm definition, at least there is a perk to all that baby carrying! I wear vests all winter long! I'm always cold and it adds another layer. Love this tweed one on you! I love the purple plaid and the red lip combo, it made the outfit pop! cute! Love the outfit! That necklace is so pretty! You look fantastic! That is why I picked a bag that can double as a handbag for diaper bag. It got to be too much to lug around. Although with two littles both needing things from a diaper bag it may be harder to accomplish now. I LOVE this outfit so much! Especially the boots! It's so great to be back in the fashion blogger world. So great to see you and your fabulous style! I hope you'll like up with the FAshion Informant this week! I love the vest! It finishes off the outfit perfectly, along with the pretty necklace. I need to buy one or two vests to wear at work because it's so cold in the office - I end up wearing my coat all day! I really love this hunters boots trend right now. I think they're sooo cute, and pretty reliable too! Ideal for the thick snow!